Last month, we reported on the closure of a western chunk of the Burke-Gilman Trail (BGT) near the University of Washington. At the time, Seattle City Light was conducting utility work near their substation below Interstate 5. The detours were challenging for walkers, joggers, and bicyclists along this portion the trail. The biggest pinch was felt when the bridge over 6th Ave NE was closed forcing trail users to the streets and tight sidewalks along NE 40th St and NE Pacific St.
Seattle City Light and the Seattle Department of Transportation implemented a unique, temporary cycletrack on sections of NE 40th St and NE Pacific St parallel to the BGT. While westbound traffic was rerouted off of these streets to create a one-way system, it was fraught with deeply confused bicyclists, drivers, and pedestrians–so much so that Seattle City Light had to post a video of how the detours worked. The NE 40th St reroute when it was in effect. Thankfully, this work wrapped up on time and with an improved BGT. New gravel has been placed at the edges of the trail while brand new asphalt has been laid down where utility work was conducted. In total, this amounts to about 1/4 of mile resurfaced improvements. Your tires and feet will appreciate it. Meanwhile, other work continues on the BGT near the UW as contractors work to improve sections near Rainier Vista and the Montlake Triangle. Trail users should take note of the restricts and detours currently in effect (you can see them in the map below). Part of the Montlake Triangle construction will keep King County Metro Route 44 on reroute until February 17th (tomorrow). Potential building envelope of 2&U, courtesy of DPD. Seattle could soon be seeing another tree-like tower dot the skyline. Skanska USA, a large national development firm, has partnered up with the architects of Pickard Chilton to build a new 34-story skyscraper and podium structure in Downtown Seattle’s West End. Called 2&U, the project will sit on three prominent corners between the streets of 1st Ave, Seneca St, 2nd Ave, and University St. But don’t worry, the Diller Room and its humble brick building aren’t going anywhere. The developer hopes to create 690,000 square feet of new Class A office space and approximately 30,000 square feet of ground floor retail. While the street vacation of the alleyway is proposed, the developer plans to compensate for this by providing through-block pedestrian connections that would link University St and Seneca St in a diagonal fashion while other openings would be provided east of the Diller Room and on the corner of Seneca St and 2nd Ave. The project manages to achieve this by creating an open-air pathway and central courtyard on the site. Cantilevered above the open space, retail buildings, and pathways would be the towering office space. Think of it as a grandiose arcade. Pedestrian circulation and access for 2&U, courtesy of DPD. Of course, the plaza space is not the only public-oriented feature. A new south-facing rooftop garden space would be accessible from paths snaking from the higher grounds of Seneca St and 2nd Ave, and the courtyard. The northeast, southeast, and southwest corners would all see landscaping and passive open space treatments to give some measure of breathing room for passerby, shoppers, and office workers. Open space and landscaping for 2&U, courtesy of DPD. The zoning for the site is a mix. The eastern half has the benefit of DOC1 U/450/U zoning (Downtown Office Core) with a maximum height 450 feet. The western half has a lesser zoning type of DMC 240/290-400 (Downtown Mixed Commercial). Given that the tower will be focused one the eastern half, the zoning of its western half is of little important. Downtown development regulation generally require separation of towers on the same block, so it wouldn’t be possible for the developer to much more than they’re proposing. Site context of 2&U, courtesy of DPD. The developers have considered the access issues for the site well. All vehicular access to the development site has been focused on Seneca St. Those wanting to park can enter and exit the underground parking garage from this bi-directional street. Meanwhile, building services like truck loading and trash pickup will also be located in the same area. 500 parking stalls would be constructed on five floors of underground parking. A suite of significant departures from code are proposed, with superior building design and user experience being the basis for the departures. One of the proposed departure consists of corner landscaping and deep building setbacks. Under the Land Use Code, a structure would normally be required to be have a smaller setback from the sidewalk. Other departures include reduced modulation and increased upper floor building width (no stepping back). However, the developer feels that features like these will enhance the quality of the overall structure by giving it a more earthy and shaped feel. Upper floors of 2&U and the skyline, courtesy of DPD. For all the good that this project may be, some really high quality masonry buildings will have to say goodbye to Downtown. The Galland Building stands prominently on the corner of University St and 2nd Ave. The building has a very attractive whitewashed facade and stands five stories tall. The building still serves as an office building. Meanwhile, the Seneca Building, a three-story retail building, is stellar example of red brick masonry common of the early 1900s. The beautiful blue transom and window box panelling will be sorely missed. If you’re interested in attending the community design review meeting for this project, you can do so tomorrow night. The Downtown Design Review Board will meet at City Hall in Room L280, located at 600 5th Ave. The 2&U design review meeting begins at 5.30pm. Alternatively, if you wish submit comments in written form, you can do so by e-mailing Garry Papers, Project Planner, at Garry.Papers@seattle.gov and the Department of Planning and Development (DPD) at PRC@seattle.gov. Seattle Building Permits Visualization by data.seattle.gov on YouTube. A short visualization of building permits in Seattle since 2006. This is astounding! Sen. Curtis King (R-Yakima) unveils his transportation plan on Thursday. Trying to kneecap Sound Transit: Senate Republicans come up with a purported “bipartisan” statewide transportation plan that would give new funding authority for Sound Transit 3, but severely limiting taxing options and project scale. Meanwhile, the transportation plan would focus almost exclusively on new highways. Should the plan pass in its current form from the Senate, it would require dramatic reconciliation with Democratic House version. Changing pot rules: Medical marijuana rules governing cultivation and procurement could be significantly changed if one Republican Senator has her way. New pricing: Pronto! has released a new set of prices for monthly members and pensioners. N: harassment: A group in opposition to Swedish Medical Center’s expansion plans have been harassing the organization. Swedish has sent a cease and desist notice to the group. Representation for renters: With the rents reaching sky-high rates, the head of the Tenants Union of Washington has jumped into the Seattle city council race. Connecting Olympia: Last week, the Tacoma New Tribune opined that Sounder to Olympia was a long ways off due to expensive costs. But Brian Bunbridge says that resurrecting an alignment may not be out of reach–assuming that parts of Thurston County are added as a Sound Transit service area. Appealing growth: A number of parties have jumped in to block options for housing and access to jobs in the University District. They hope to overturn the recently completed environmental review of growth alternatives. Red or blue: Richard Florida asks what makes a dense urban county vote Republican, and finds that core urban counties may not be as blue as people think. Maps of the week: Four maps that show the massive population shift emanating from Central Europe, what a future DC area transit map could look like if Maryland pushes ahead with two more rail lines, and where all of the young people are living in the Seattle area..
Police living on the outside: Most Seattle East Precinct police officers don’t live in Seattle, and definitely not in the East Precinct. Meanwhile, the City of Seattle won’t support a police accountability bill proposed by Sen. Pramila Jayapal (D-Seattle). A look back: Take a walk back in time to 1885 and see what Capitol Hill was like. Big opposition: Advocates don’t want a new youth detention center in First Hill, but the King County Council passed an ordinance in favor anyway. Paving paradise: Florence could fit perfectly within one whole Atlanta cloverleaf interchange. Meanwhile, Dallas advocates are trying to shutdown a rebuild of a freeway through the city. Shoreline rezones: Residents fill a council meeting to express their fears about a series of rezones. Rebuilding 520: Tom at Seattle Bike Blog takes a close look at the current plans for the Seattle rebuild of SR-520. Fighting for a stand, losing the forest: Futurewise argues that Seattle is reducing its tree canopy, but their numbers are questionable at best. The success of urban villages: CityLab takes on Seattle’s urban villages strategy and concludes that it’s fighting sprawl. Ranking transit: Washington State rounds out the top 6 for transit usage. Seattle’s Vision Zero: Sightline takes us through what Seattle’s Vision Zero program will do. New parklet: A sixth parklet will be debuting on the 21st of February in Lower Queen Anne. Spotting a gray: In a rare instance, a gray whale swims through the Port of Tacoma‘s network of waterways. Keep a lookout for the new green timetables on buses and at timetable information kiosks. This service change is relatively minor, the last before the Proposition 1 funded changes start going into effect this June and September. Beginning February 14, Metro’s Customer Information office will be open from 6:00 a.m. to 8:00 p.m. Monday through Friday for trip planning and Lost & Found calls, and from 8:00 a.m. to 5:00 p.m. for ORCA calls and customer comments. The office will be closed on weekends and major holidays. The Customer Stop on the mezzanine level of Westlake Station will be open from 8:30 a.m. to 4:30 p.m. on the first and last four business days of each month. The Customer Service office and Lost & Found at the King Street Center in Pioneer Square (201 S Jackson St) will be open from 8:30 a.m. to 4:30 p.m. Monday through Friday. In an effort to expand alternative transit service on the Eastside and to help mitigate Route 208 service reductions and the deletion of routes 209 and 215 last fall, Metro has contracted with Hopelink to operate a new shuttle service in the Snoqualmie Valley.On weekdays, Community Shuttle Route 628 will operate about every 30 minutes between 5-8 am and 5-9 pm. It will operate on a fixed route to and from North Bend and the Issaquah Highlands P&R via Snoqualmie and Snoqualmie Ridge, and also provide service on request at designated stops within a flexible service area in the Issaquah Highlands. 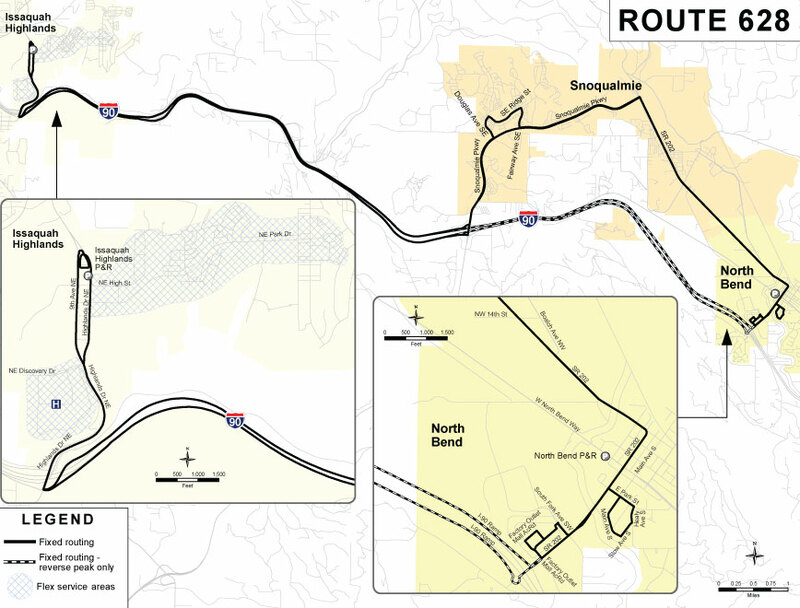 To schedule service in this area, call 855-233-6043.Route 628 will operate via SR-202, Snoqualmie Parkway, SE Ridge St, Douglas Ave SE, I-90 and Highlands Drive NE. It will also operate a reverse peak-period express service (eastbound in the morning and westbound in the evening) to and from the Factory Outlet Mall in North Bend and the Issaquah Highlands P&R via I-90. Regular Metro fares will apply.Metro routes 208 and 224, and the Snoqualmie Valley Transportation (SVT) shuttle also provides service in the Snoqualmie Valley. The southbound Route 7 schedule will be revised to provide improved service to and from S Prentice St. In early February, Route 50 will serve a new bus stop inside the Veterans Administration Medical Center. If the new driveway and entrance is not finished by the start of the service change on February 14, Route 50 will continue serve the bus stops on Columbian Way S, just east and west of the entrance to the medical center. Southbound Route 55 to the Admiral District will serve the bus stop westbound on Wall St just east of 5th Ave. It will no longer stop at the bus stop westbound on Bell St just west of 7th Ave.
Southbound Route 111 to Lake Kathleen will serve the bus stop westbound on Lenora St just east of 4th Ave. This route will no longer stop at the bus stops westbound on Bell St just west of 7th Ave, and on 2nd Ave just south of Bell St.
Southbound Route 114 to the Renton Highlands will serve the bus stop westbound on Lenora St just east of 4th Ave. This route will no longer stop at the bus stops westbound on Bell St just west of 7th Ave, and on 2nd Ave just south of Bell St.
Southbound Route 143 to Black Diamond will serve the bus stop westbound on Lenora St just east of 4th Ave. This route will no longer stop at the bus stops westbound on Bell St just west of 7th Ave, and on 2nd Ave just south of Bell St. The southbound Route 193 trip to Federal Way leaving E Jefferson St & 18th Ave at 7:05 pm will be revised to leave 35 minutes later at 7:40 pm. The span of service for southbound Route 204 trips to south Mercer Island will be extended by about an hour in the evening. The last southbound trip leaves the North Mercer Island P&R at 7:03 pm. The westbound trip to downtown Seattle leaving the Eastgate P&R at 7:21 am will be revised to leave six minutes later at 7:27 am. Eastbound Route 255 trips during the afternoon peak period will be revised to help eliminate a 29 minute gap in service between 7:15 and 7:44 pm. Also, a westbound trip to downtown Seattle leaving the Kirkland Transit Center at 5:44 pm will be deleted. The northbound Route 303 trip to the Shoreline P&R leaving E Jefferson St & 18th Ave at 7:18 pm will be revised to leave 22 minutes later at 7:40 pm. The southbound Route 312 trips to downtown Seattle leaving the Kenmore P&R at 7:16 and 7:23 am will be revised to leave at 7:18 and 7:22 am instead. At Kent Boeing, DART Route 913 will be revised to operate via 59th Ave S, S 208th St and the Kent Boeing Access Road in both directions. It will no longer operate on S 212th St between 59th Ave S and 66th Ave S, 66th Ave S, S 208th St, 67th Ave S and the roadway on the east and south sides of buildings 18-61, 18-67 and 18-62. Beginning in early April, southbound Route 4 will only operate as far as 21st Ave & E James St for about eight months due to a long-term construction project on 23rd Ave S.Alternative nearby service to downtown Seattle is available via Route 2 on E Union St, Route 3 on E Jefferson St, Route 7 on Rainier Ave S, Route 8 on Martin Luther King Jr Way, Route 14 on S Jackson St, Route 27 on Yesler Way and Route 48 on 23rd Ave.In conjunction with the start of the Route 4 routing revision, Route 8 will be revised to operate, in both directions, on Martin Luther King Jr Way S between S Jackson St and E Yesler Way. It will not operate via S Jackson St, 23rd Ave S and E Yesler Way northbound or via E Yesler Way, 23rd Ave S and S Jackson St southbound.Also, northbound Route 48 service on 23rd Ave S will be rerouted between S Jackson St and E Cherry St via Martin Luther King Jr Way. Route 48 will serve the bus stops eastbound on S Jackson St just east of 23rd Ave S, northbound on Martin Luther King Jr Way at E Alder and E Cherry streets, and westbound on E Cherry St at 25th Ave. Southbound service will be maintained but traffic delays should be expected. In conjunction with the start of the Route 4 routing revision, Route 8 will be revised to operate, in both directions, on Martin Luther King Jr Way S between S Jackson St and E Yesler Way. It will not operate via S Jackson St, 23rd Ave S and E Yesler Way northbound or via E Yesler Way, 23rd Ave S and S Jackson St southbound. In conjunction with the start of the Route 4 routing revision, northbound Route 48 service on 23rd Ave S will be rerouted between S Jackson St and E Cherry St via Martin Luther King Jr Way. Route 48 will serve the bus stops eastbound on S Jackson St just east of 23rd Ave S, northbound on Martin Luther King Jr Way at E Alder and E Cherry streets, and westbound on E Cherry St at 25th Ave. Southbound service will be maintained but traffic delays should be expected. For more detailed information look in the new Ride the Wave guide on all Sound Transit vehicles. A PDF of the new Guide is also available at soundtransit.org/schedules. New bus schedules are available at communitytransit.org and you can now use the Trip Planner to plan your trips after the service change. New Bus Plus schedule books will be on buses starting Friday, February 6. Route 412 will have adjustments to the first three morning trips heading to Seattle. This includes permanent scheduling of a trip that was added last fall to meet demand. Please note that this route is not operating on Presidents Day. Route 425 will have its first trip leave several minutes earlier. Please check times at your stop. Please note that this route is not operating on Presidents Day. Sound Transit Route 510 will have the permanent addition of a morning trip to Seattle that was added last fall to meet demand. He got on along with the great mob at 4th and Pike. Somebody in front of him was taking an extra moment to pay cash, and he’d tapped his ORCA card and snuck quietly past, but my “how’s it going” reached his ears. The man had been planning to walk further back, but after seeing the way I greeted everyone he sat down up front with a smile, grinning as one does upon coming across something at once energizing and unexpectedly familiar, like a relative you’d forgotten how much you liked. He responded by asking how my day’s been. “It’s been fan-tastic,” I said. He cackled with shared delight, perfect rows of teeth highlighted against his dark skin and rugged attire. “Sign spinner,” he said sheepishly. “Oh, sweet! Like ‘slow and ‘stop? '” He nodded with a rueful smile, which blew into a huge grin upon my saying, “That’s awesome!” I was thrilled at the opportunity to learn more about the job I see so often. We talked about his job, then about mine, how nighttime is the best time for driving, how the light cycles are shorter, the people are fun, how great I think the 7 is, and so on. Through the course of all this we found ourselves using terms like ‘fortuitous’ and ‘elated,’ and it wasn’t just myself lobbing off the four-syllable words. Here was a man who shared my passion for learning, no matter his career or life circumstances. Then, after a pause, a new thought occurred to me. I’d been trying to imagine the job from his perspective. “Love that word,” he said. “Me too! I so rarely get an opportunity to use it in a sentence!” The giggling fits began anew…. We’re nearing a year since the opening of the 4-block Bell Street Park between 1st and 5th Avenue in the Belltown neighborhood of downtown Seattle. New businesses have opened, traffic patterns have been changed to facilitate pedestrian flow, and consequently more and more people flock to the area. Remember the past (incorporate the rich history of Belltown), look to the future (focus on sustainability), and be in the present (create a destination). Keep Bell Street active all year round! Allow the Park to act as a front porch for all socioeconomic levels of neighbors in Belltown. Create a framework for individuals to champion future community events. Facilitate quick and easy permitting and implementation through collaboration with City staff. Encourage a diversity of event types and art interventions. Build on the Park as a vibrant, green and safe place that Belltown can be proud to call its own. If you can’t attend, you can also provide feedback online at bellstreetpark.com. Introducing Vision Zero for Seattle, courtesy of SDOT. On the backdrop of Lake City Way yesterday afternoon, Seattle Mayor Ed Murray met with dozens of supporters and advocates to unveil his citywide plan to eliminate all traffic deaths and serious injuries by 2030. The Mayor was joined by Scott Kubly, Director of the Seattle Department of Transportation, and Kathleen O’Toole, Chief of Police for the Seattle Police Department, who will help spearhead the Vision Zero program by joining forces to reduce speeds, design safer streets, restrict right turns on red, and conduct active police enforcement. The Mayor’s plan will build upon many of the elements and policies previously identified and implemented through former Mayor Mike McGinn’s Be Super Safe initiative. Here’s a portion of the full press release from the Mayor’s Office. Conduct targeted enforcement throughout the city for school, pedestrian and bike safety, along with enhanced DUI enforcement. SDOT and SPD will work together to educate people in advance of these patrols, so everyone will expect enforcement and better understand the rules of the road. The Seattle Police Department has embraced a data-driven approach to law enforcement through SeaStat, which quickly addresses crime hotspots based on analysis of crime data and community reports of incidents. In partnership with the SDOT, SPD will use a similar approach to address traffic collisions.